What's your favourite animal? Use it as your inspiration today. For my fabric play I continue to work on the heirloom embroideries. The current piece is a large doily (yesterday's flowers) and two smaller doilies. The smaller ones are already stitched; the larger one is in progress. In addition to the flowers, each doily has a blue bird. 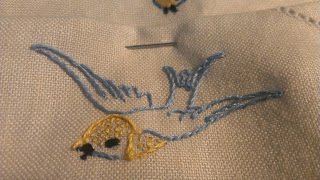 Today's TV project is finish the remaining blue bird. I love birds, all birds. There is such diversity. Australian birds are colourful, tuneful, intelligent. Not always all in one bird, the poor ol' raven is not colourful or tuneful, but they are incredibly intelligent. The darker two (to the right) were already completed. These are on the smaller two doilies. 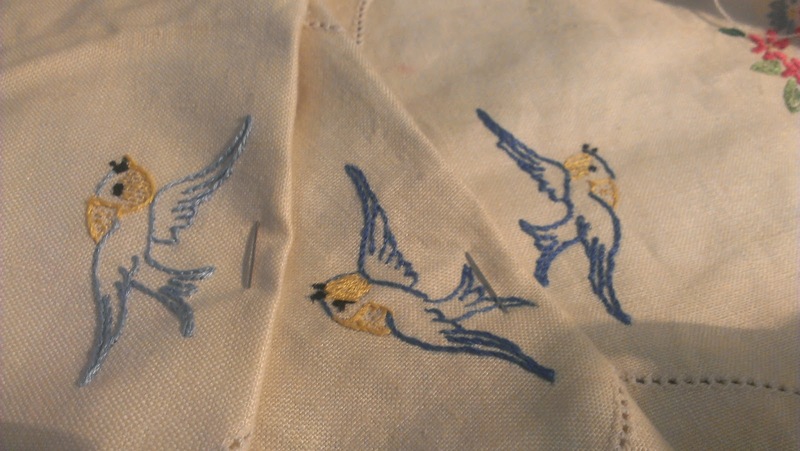 The bird to the left is on the larger doily and is today's fabric fun. My little blue bird of creativity.